If you want to retire, then you better put your money to work. View your retirement savings as a little army that is going to fight for your future income. They need to be trained and ready for battle. No matter what the conditions are, no matter if it looks easy or hard, they must go to war to win your retirement income. Do you remember the game of RISK? You would battle for world dominance. Let’s play that game but with less on the line. Forget world dominance. Let’s just play for peace of mind regarding your future retirement income. The first thing to do is pick a side. On one side will be the Liquidation strategy and on the other side you will have a Dividend Income strategy. Let’s look at the army of Liquidation first. This army’s strategy is the most common and is where the 4% rule comes into play. It’s based on the premise that your assets will grow at an assumed rate of return, and that you will liquidate some of that growth for income to live on in retirement. The 4% rule was created to give investors the peace of mind to believe that if you only withdraw 4% from your investments each year, then you should not be in danger of running out of money. Seem feasible right? The other army you can choose is the army of Dividend Income. This army operates completely differently than the army of Liquidation. I would liken this army to the new age army that goes into battle with drones and robots that are controlled from a safe distance. Dividends get paid on the number of shares you own and not the value of your shares. So, if you own 1,000 shares of ABC stock and it is paying a $1 dividend per share, then you are paid $1,000 in dividend income. It doesn’t matter if the stock price per share is $10 or $100 or more, you get paid $1,000 regardless. Again, this is like having an army of drones and robots where you don’t have to worry about injury or loss of life. Are you ready to pick a side? Your future income will depend on it! For the game, we need to create some ground rules for which both sides need to abide by. We are going to use a 65-year-old that is retired. He is going to live until the age of 95 where he peacefully and gracefully walks out on life. Each army will be given $1 per soldier and 1,000,000 soldiers to fight their battle. Both sides will start with an 8% total return. All returns assume a constant annual growth rate with no fluctuations. If we were to play this game with fluctuations, the results wouldn’t even be close. We will explore this a bit more later. Are you ready to play and see the outcome? As you can see from the chart below, the Liquidation army performed well. It started with $1,000,000 and after all is said and done, it ended with a grand total of $4,533,118. Of this total, $2,542,029 came in the form of income throughout retirement and the remaining $1,991,089 was the resulting “size” of the army after the battle ended 30 years later. Not bad. And now in the chart below, you can see that the Dividend Income army performed even better. It also started with $1,000,000 and after it was all said and done, it ended with a grand total of $5,466,497. Of this total, $2,966,416 came in the form of dividend income throughout retirement and the remaining $2,500,080 was the “size” of the army after the battle ended 30 years later. The crazy part of this game is that I only illustrated a 3% flat annual growth rate with an initial 5% annual dividend. Now, the dividend income rate did grow at an assumed rate of 4% per year. 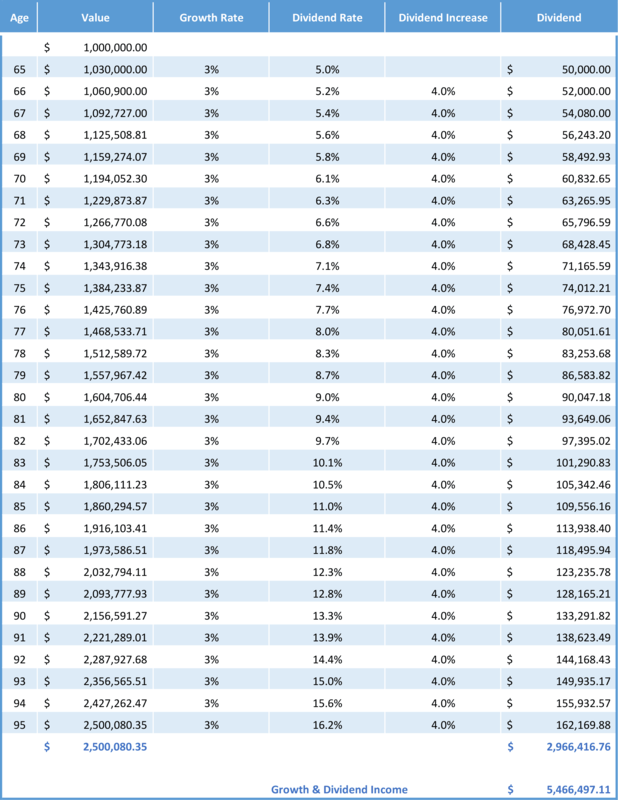 As is common with many dividend paying companies, dividend rates can grow. In this “game” we assumed an annual 4% growth rate in the dividend. Depending on the company selection(s), this growth rate could be more or less than the 4% used. The game is now over, and you get to reflect on the results. The best part of this exercise is that the game never happened, and you get to take the information presented here and use it to select your own strategy and encourage your own “retirement savings” army to fight your retirement income battle for success in your future! The Liquidation army will always be concerned with fluctuations. I did not show an example of this. You need monthly income in retirement. It doesn’t matter if the market is up or down, the income is still needed. If the market is down, the Liquidation army is damaged. It is similar to your army’s soldiers being injured or ill and being pulled from the battlefield. This means these soldiers are no longer available to capture additional income. On the other hand, the Dividend army does not need to worry about fluctuations. Dividends are paid whether the market is up or down. With the market up or down, all of your soldiers still are in the battle. If some of the soldiers in your army are injured or ill (down market), they still fight and operate their drones and robots from behind the lines and still capture income. The battle has begun. The choice is yours.